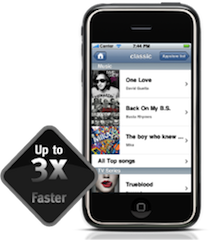 iWebKit has been specially made for Apple mobile devices. This means that we are using specific iphone css and html rules compatible with safari’s engine called “webkit”. Because of this specific language most browsers won’t be able to open an iWebKit site correctly, currently only chrome and safari do on a desktop PC. If you do use one of those browsers or if you are on an iphone, ipod touch or ipad, you can go to http://demo.iwebkit.net to check iWebKit out. For the ones how don’t have a Apple mobile device or the right browser we have added some screenshot below. If you have any questions about iWebKit or how to use, please read the user guide included in the kit or go to the iwebkit community!